Coffee Cream Scones-- the tiny black dots are finely ground coffee. 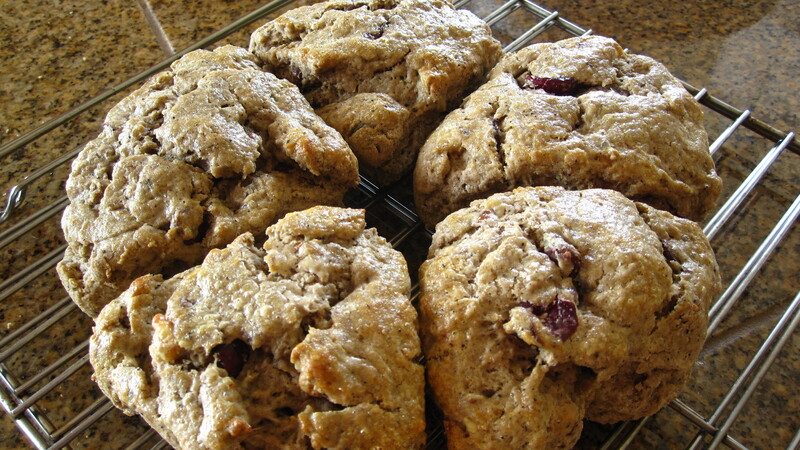 10/15/10 update: I made these coffee scones again. This time they looked much prettier and not as dark... see note below. 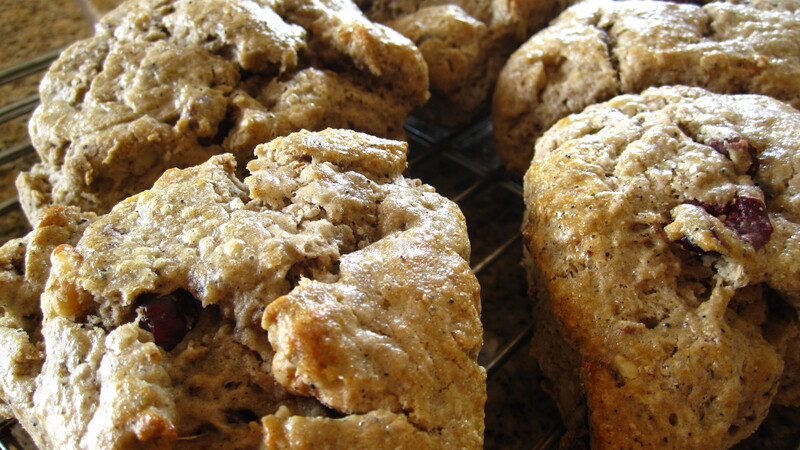 When these scones fresh out of the oven, you can smell the coffee in the air. 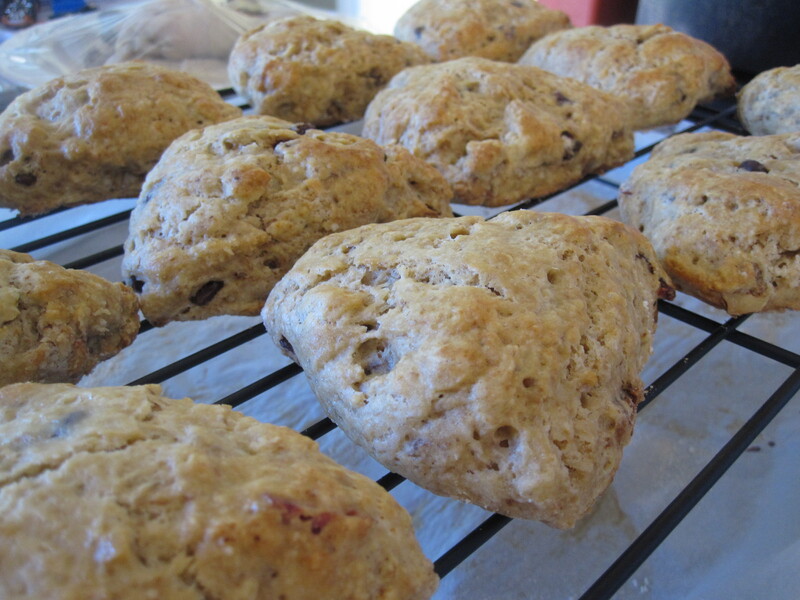 Take a bite and you’ll taste chocolate!… This is why I love these scones! In a large bowl, stir flour, coffee, sugar, baking powder and salt to combine. Rub in butter until the mixture resembles of coarse crumbs. Add walnut, chocolate chip and cranberries and mix well. Add eggs, vanilla extract and cream in a small bowl, whisk to combine. Scoop out 2 tbsp to reserve for egg wash. Pour the egg mixture all at once into the flour mixture. Use a spatula gently stir until the dough comes together. Do not over mix or the scones will be tough. Transfer the dough to a lightly floured surface and knead the dough gently 4-6 times, then divide the dough in half. Pat each half into 6 inch circle, and cut into quarters, for a total of 8 wedges (for smaller scones cut each disc into 6 triangles, for a total of 12 pieces). Place scones on a lined baking sheet, 2 inches apart, and chill in freezer for 30 minutes. In the meantime, preheat oven to 400°F. Brush scones with reserved egg wash and bake for 15-18 minutes, until the center is baked through and golden brown on the edge. Serve immediately. I made these scones the second time using whole milk and only 1/2 tbsp coffee powder. The dough was pretty wet and required more dusting of flour during kneading/shaping. However, the scones turned out beautifully after baking and not as dark as first time. The aroma of coffee is light. Personally I would stick with 1 tbsp of coffee powder to give the scones more flavor. 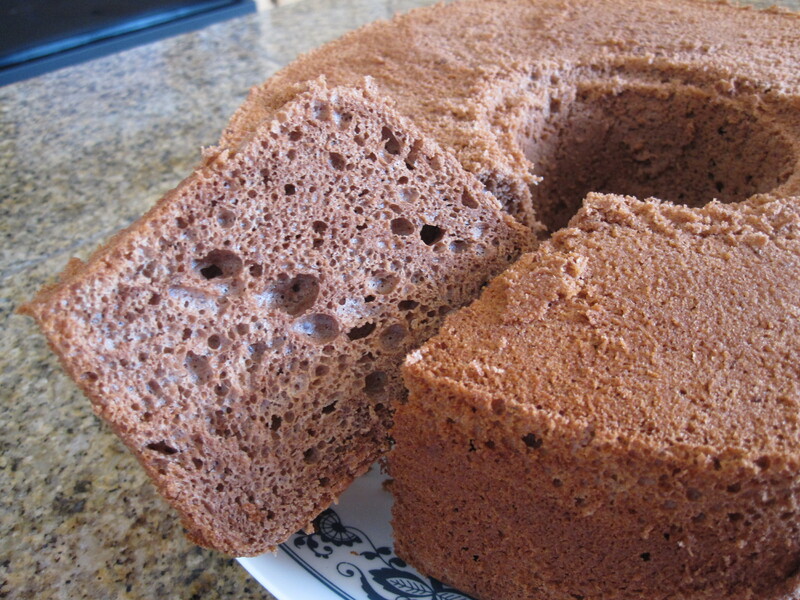 On my birthday, I baked myself a chocolate chiffon cake instead of getting a cake from the bakery. This is my first attempt and it turns out pretty good. The cake is moist and full of chocolate flavor, with some big holes inside even I tapped the cake batter twice on the counter before baking. Compare to other chiffon cakes that I have made, this chocolate version is a little dense and the cake is relatively shorter even though I used 5 eggs… I wonder is it because of the amount of cocoa powder that I put in?? — it gotta be proportion of the cocoa powder versus water/oil in the batter… I will have to fine tune the recipe next time. Anyway, I served it with some mixed berries (now is the strawberry season) compote and whipped cream… mmm, life is good. 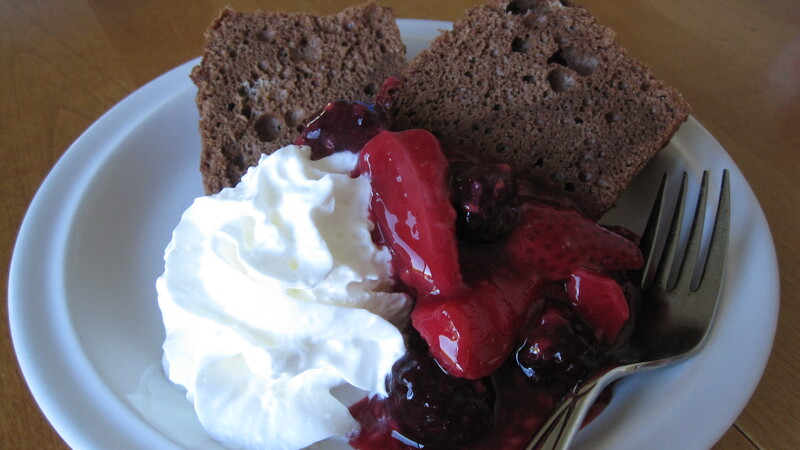 Chocolate chiffon cake with whipped cream and cold mixed berry compote... yum! Preheat oven 335°F. Combine flour, cocoa powder, baking powder and salt then set aside. Hand whisk egg yolks and sugar until fluffy and pale in color, about 4-5 minutes. Add in oil, water, rum and mix well. Sift in flour mixture and mix gently until just combined with no dry flours. Whisk egg whites until foamy, add cream of tartar and whisk for a little while. Gradually add in sugar, one tbsp at a time, and beat on high speed till peaks form (reduce to med speed later to avoid big air bubbles). FOLD IN 1/3 of egg white into egg yolk mixture gently with a spatula until just blended. FOLD IN remaining 2/3 of egg white into the egg yolk mixture in two batches. Take care not to over blended. Pour the batter into a chiffon cake pan. Lightly smooth the top. Tap the cake mold on kitchen counter 1-2 times and bake for 45 minutes. Do not open the oven door while it’s baking or the cake won’t rise. Invert the cake IMMEDIATELY after baking to let cool (I use 3 stack-up cooling racks but you can use a sturdy tall bottle). Remove the cake from the pan when it is completely cool. This is a sample of my works (students' exhibit) displayed at the school Open House. Click the picture for larger view. So, this is what I enjoy besides stirring up in the kitchen. 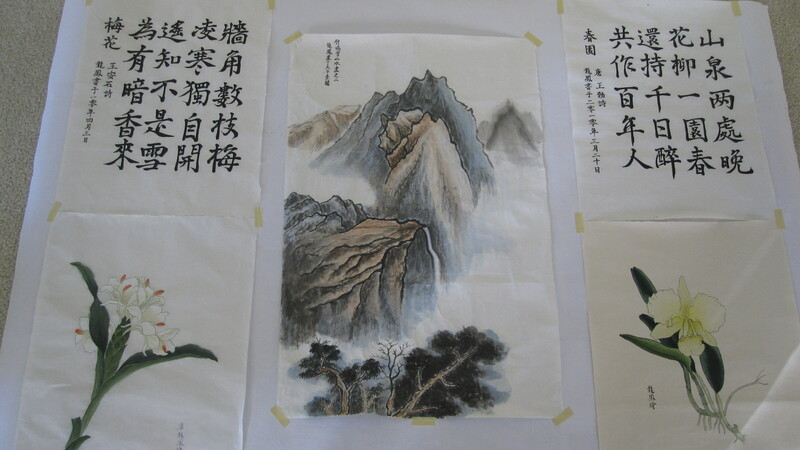 Actually I am always interested in Chinese calligraphy and brush painting, but just didn’t come across the opportunity until Alexander’s Chinese school offered this class last year. I’ll be setting a profile and starts posting all my works to track my learning progress. I hope you like it too like I do! Classic Seremban ‘siew pao’ uses BBQ pork or chicken, green peas and onion as fillings, but this time I used ‘mui choy kau yoke‘ (braised pork belly with preserved vegetables) instead as I had some leftovers in my fridge. I just cut the meat into smaller pieces and thicken the sauce to the gluey stage (to prevent the sauce from oozing out during baking). The result was very good. The pleating part was challenging but fun. I had some pao’s sealed up pretty good but some opened up on the top. 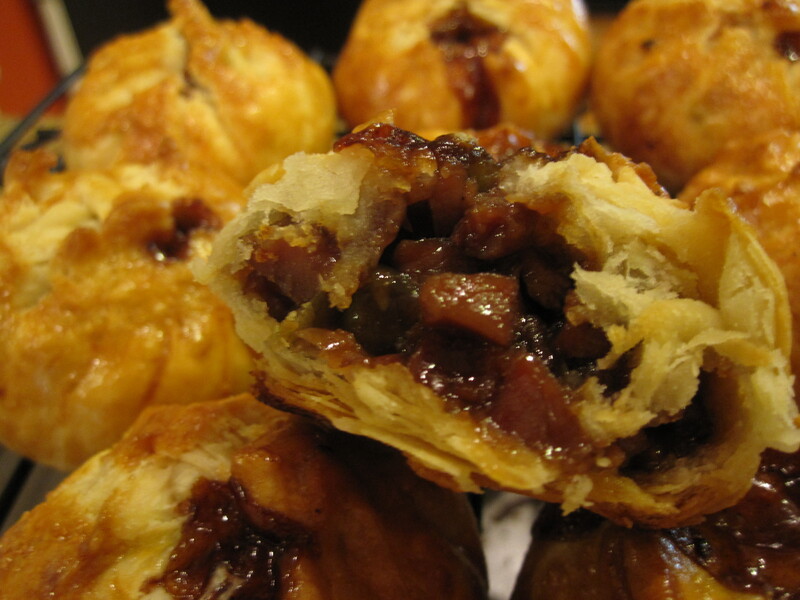 The taste of the ‘mui choy kau yoke‘ matches very well with the flaky layered pastry. 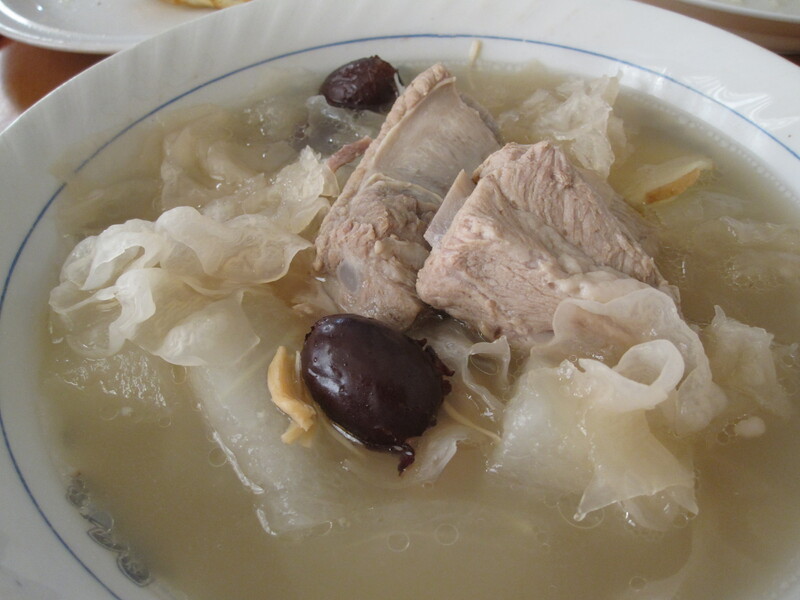 ‘mui choy kau yoke‘— cut meat into smaller pieces and use cornstarch water to thicken the sauce to a gluey stage. Let cool before use. Prepare water dough: Rub oil with flour until crumbly. Dissolve sugar and honey/syrup in water then add to the flour mixture. Knead the dough until smooth. Cover with plastic wrap and rest for 30 minutes. Divide and shape into 18 small balls. Flatten each ball with palm then roll out to a 2-inch circle. Prepare oil dough: Rub shortening into flour and slowly form a soft dough. If the dough gets too sticky to handle, chill in the fridge for a few minutes. Divide into 18 pieces and roll into small balls. Turn the dough 90°, flatten it and roll it out thin. Then roll it up like a Swiss roll. Repeat step 3-4 with the remaining water dough and oil dough. Take 1 piece of pastry dough, pinch the long ends together then flatten it so the dough is roughly round shape. Roll the dough out to a thin 5-inch circle. Scoop in 2 tbsp of filling. Pinch and seal tightly (be sure no air pocket inside, and seal really tight otherwise the filling will leak out during baking). Brush egg wash on top of the pastries. Bake in preheated 390°F oven for 25-30 minutes until nicely brown on the surface. Apply egg wash half way through baking. Cool on the rack. ‘Siew Pao’ is a type of Malaysian snack. 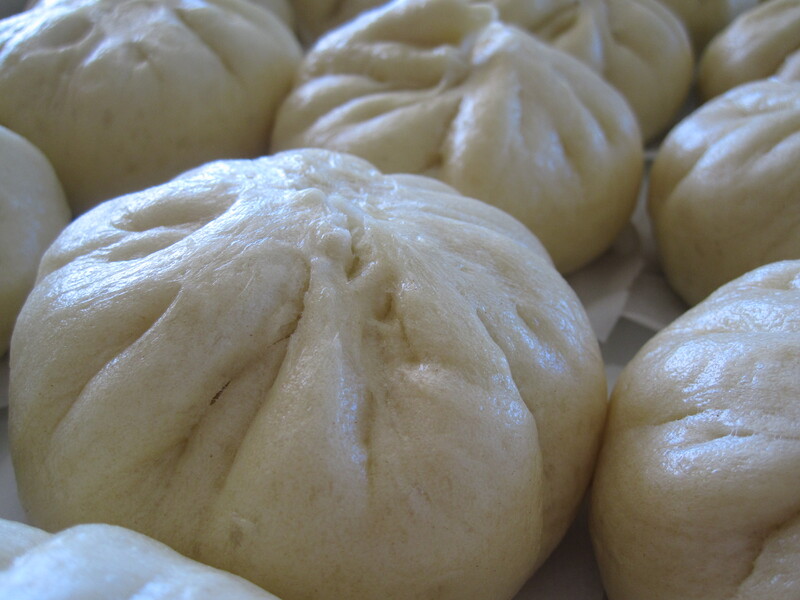 It is pleated just like a steamed pao (steamed bun) except the it is baked in the oven. The filling usually consisted of BBQ pork and green peas, and it tastes savory and yet a little sweet. 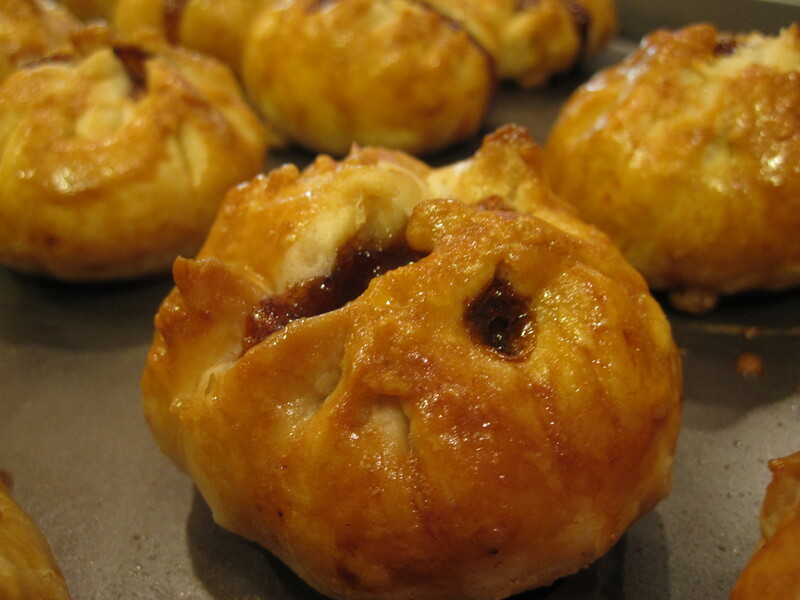 The pastry dough is made using water dough and oil dough to create layers. In Malaysia, Seremban is the town that makes Siew Pao popular so people always call this snack Seremban Siew Pao. I love most Chinese pastries that calls for water dough and oil dough– the finished baked goods are so flaky that I just couldn’t resist. However, it’s lots of work to make such pastries. This time when I made Seremban ‘siew pao’ I encounter a problem as my pao’s won’t seal tight– the pastry dough keeps shrinking back after I pinch them up tight… and thus creating a hole on the top of the pao, and of course some filling sauce leaked out during baking. Oh well, they taste delicious nonetheless. Prepare filling: Heat 1 tbsp oil in a pan and saute onion until fragrant. Add remaining ingredients (except cornstarch water) and stir to combine. Add cornstarch water (stir it before adding) and stir until the sauce thickens and looks gluey. Set aside to cool down. Note: filling can be prepared ahead of time and kept in the fridge or freezer. If you like ‘mui choy kau yoke‘, try make this steam pao– I promise it won’t disappoint you. 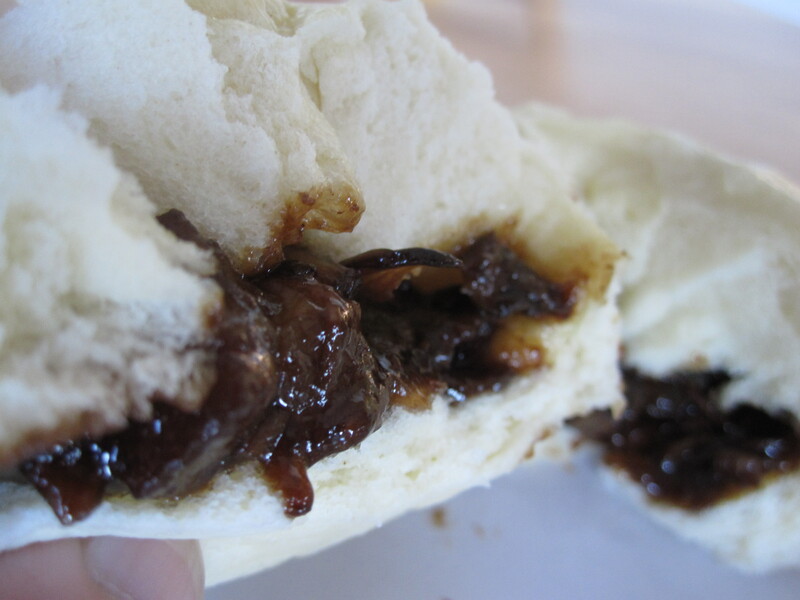 The plain pao wrapping balances the rich taste of the filling. 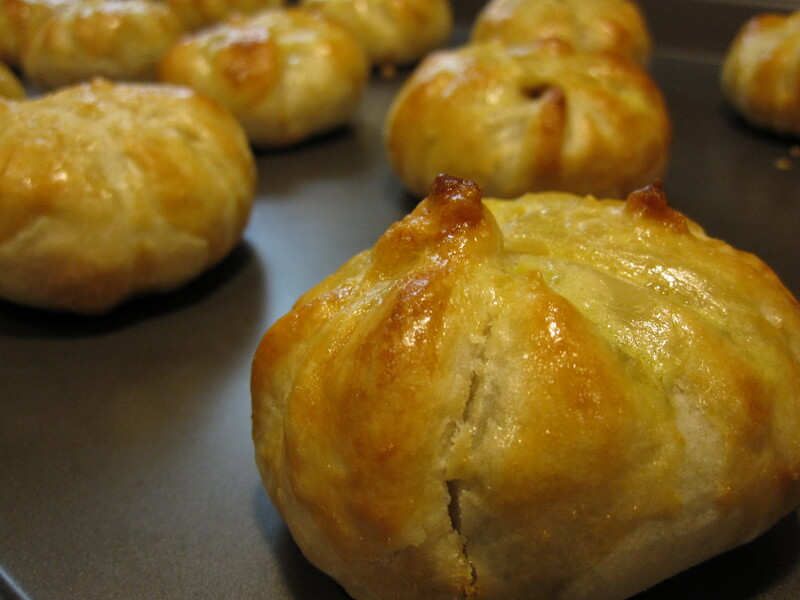 I tried ‘mui choy kau yoke‘ with ‘siew pao’ baked pastry version, and it was good… but steamed pao matches the flavor even better! As far as the pao dough, this is my first attempt and I find it not difficult at all. Just like any other yeast/leavened dough, it just takes some time to rise. Steaming is quick and the pleating part is fun; it’s much easier to pleat leavened dough than the pastry dough for making ‘siew pao’ (pastry dough tends to shrink back and thus requires really good pinching and sealing skills). I used unbleached all-purpose flour so my pao’s are not snow white like those selling at dim sum places, with a pale yellow look on the outside. Anyhow, this experiment boost up my confidence of making steam pao’s. I’m sure I’ll be making steam pao’s more often in the future. Mui Choy Kau Yoke— cut the meat into smaller pieces, and add more cornstarch water to thicken the sauce to a gluey stage. Cool completely before use. Dissolve sugar in warm water (use microwave to speed up dissolving if desired). Sprinkle yeast and gently stir a couple of times. Let it stand for 10 minutes until the yeast floats to the top and becomes foamy. Sift flour and baking powder into a big bowl. Add in shortening and yeast mixture and mix well. Add more water if the dough is too dry; add more flour if the dough is too moist. Transfer dough onto a work surface and hand knead until smooth– I kneaded for 10-15 minutes. Place the dough back to the big bowl and cover with plastic wrap. Let the dough rise in a warm place until trippled in bulk. Gently knead the dough a few time to get rid of air pockets, then roll it into a long log. Divide into 24 equal portion. For each small dough, first roll it to a round ball then flatten it with your palm. Roll it out to a round circle using a rolling pin (thinner around the edge while thicker dough towards the center). Scoop in about 2 tbsp filling then pleat to seal the opening. Repeat with the remaining dough and filling. Rest pleated pao on parchment paper, and let it rest 10-30 minutes (no more than 30 minutes or the pao might collapse after steaming). 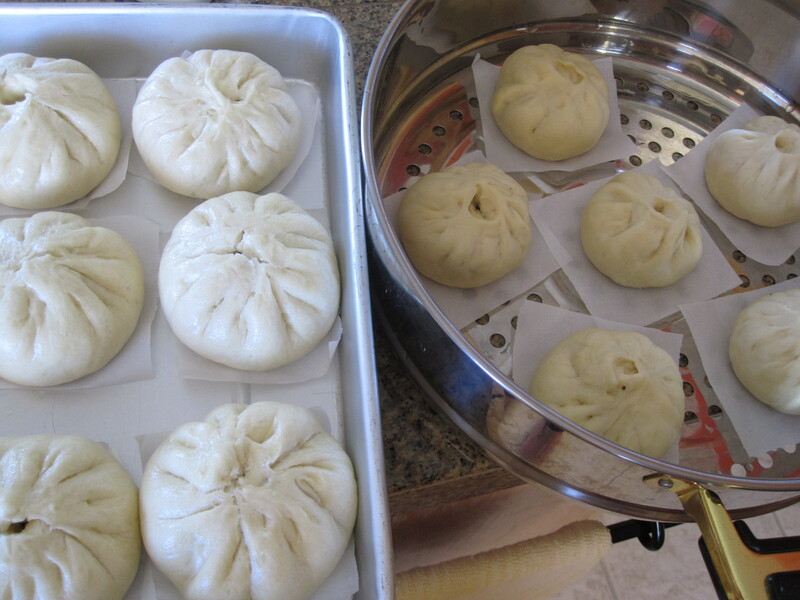 Place rested pao loosely (pao will expand to double size during steaming) on a steamer tray with holes. Steam on high heat over rapid boiling water for 10 minutes. (Always steam pao over boiling water on high heat. otherwise the pao will taste doughy and sticky). Comparison of size-- before steaming (right) and after steaming (left). 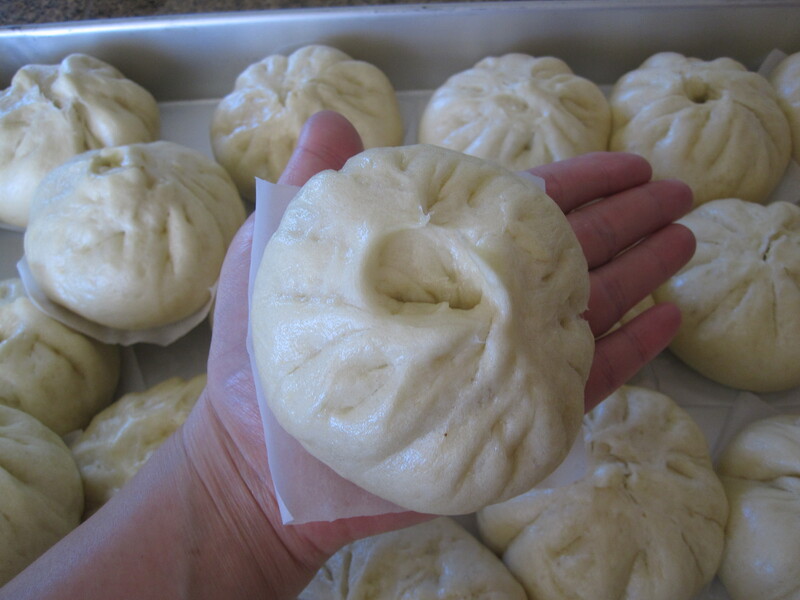 After steaming, the pao is the size of my palm (about 3.5 inches across).